Our Central Coast region — specifically Monterey County — is home to more than 8,600 state prison inmates. Hundreds more occupy our local jails, fire camps and juvenile halls. Because our mission is to include the diverse and less-heard-from voices in our area, we’re launching Voices From Inside, a series of stories written by residents of these institutions. Ever since I can remember, my Nana cooked tamales during the Christmas and New Year’s holidays. The distinct aroma of boiling Colorado chiles, carne, and the fresh-made masa is as synonymous to the holiday season as the family gathering at Nana’s house. Nana knew all the special places to get the ingredients to make her tamales. I would go with her to the Maravilla Carnicería and carry the large bowls for the masa — an important task for a young boy. The carnicería is located at the crossing of Arizona Boulevard and Cesar Chavez Avenue in East Los Angeles — a magical place with Chicano/Mexicano murals adorning the walls and loud Mexican corridos spilling into the air. As we entered, there were colorful piñatas hung from the ceiling and a good chance of Nana buying me some of the Mexican dulces they sold. My favorite were the chile paletas, an equivalent to the American lollipop or sucker, but flavored with hot chile. At our home, there was usually a full house of family or friends living with us. Nana never said no to anyone who needed a place to live. She was the sixth of twelve siblings after her parents migrated from Central Mexico to East Los Angeles during the Mexican Revolution. She told me she learned how to make tamales from her mother, and I wondered how long the tradition was passed down from each generation in my family. I do not remember Nana ever saying she was going to show me how to make tamales. The lessons were handed down as I grew up in her house and helped prepare them each year. I can see myself back in her home as I write this. The ambiance of Nana’s kitchen comes alive as she gathers all the special utensils stored deep in cabinets or hung in the washer and dryer closet because of the large amount of space they occupy. The big ollas (pots) are used to cook tamales, menudo, albondigas and frijoles. Then there’s the large cone-shaped strainer with a wooden roller to grind the chiles after they’re boiled. That’s my job. As each step in the process is performed, Nana explains the importance of the flavoring, never using measuring utensils, only her memory. She gives me the latest gossip about family members, both in complaints or how proud she is. There’s a buzz that goes around the family as they’re planning their trips from home to home, everyone knowing that when they reach Nana’s, they will be enjoying her delicious and famous tamales. For cultures around the world, food is the staple for bonding among families and communities. Nana often sent me to neighbors’ homes with tamales to share with close friends, just as there were other families who shared their tamales with us. 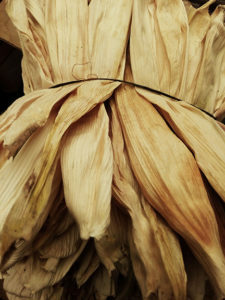 Tamales originated from the indigenous peoples of Mexico and Central America, and the origin of the word derives from the word tamalli of the Nahuatl language. Nahuatl is the mother tongue of Mexico and continues to be the most widely spoken indigenous language of North America (despite some people’s claim that after Spain conquered the Aztecs they ceased to exist). I learned the history and origins of tamales during my incarceration. In my 19 years of living in a cell, away from my family, I have made many efforts to keep alive the traditions of my upbringing. Reading, studying and reinventing a sense of home away from home has kept my spirits alive in a place designed to destroy them. In no way do I consider or choose to call the cell my “home.” It is instead a place where I can merge creativity and my will to overcome the ever-present loneliness. Loneliness is even more prevalent during the holidays, and these are the times I miss my family the most. I’ve found a way to ease some of the pain by creating a different way to make tamales. One day, while out on the prison yard, I stumbled across someone’s prison-made tamale, but it did not match my memories of Nana’s tamales. I asked a few questions about how the guy made them, and my mind started churning, thinking of ways to create my own version that would be closer to the way I remembered them tasting. The first problem I faced was coming up with a way to cook them without a lot of heat. In the cell, we’re allowed to have hot pots to heat water, but they’re small and can only be plugged in for short amounts of time, producing very little heat. In the past, I’ve seen inmates at other prisons solve the problem using a technique used to cook prison moonshine. 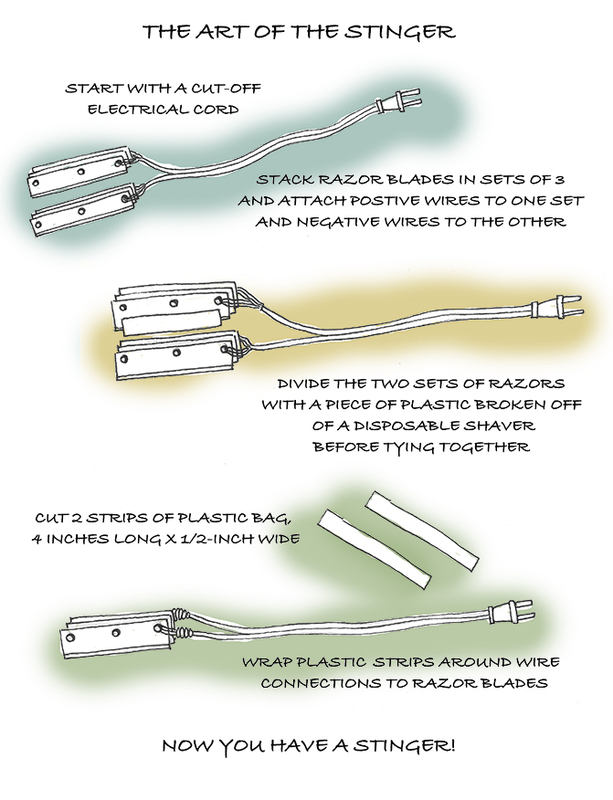 To make this device, called a stinger, all you need is an old cord cut off of a broken appliance and a couple of disposable razors. By attaching the split wire to the razor blades (positive on one side, and negative on the other), and wrapping strips of plastic around the connections from the wire to the blades, you’ll have a utensil capable of cooking all kinds of things. 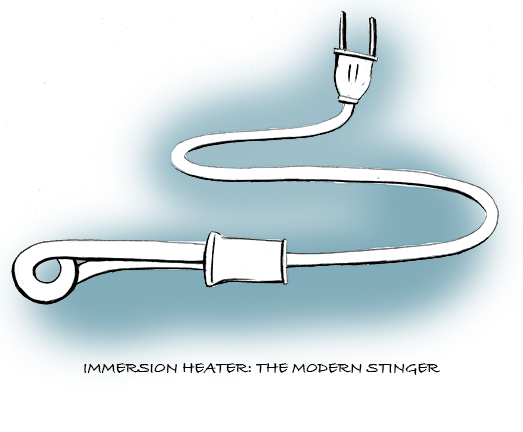 Or you can just use a 600-watt immersion heater. California prisons no longer allow these appliances to be purchased, but quite a few long-timers still have them around. Trial and error has solved many of my early tamale-making problems and I believe the recipe I’ve come up with is the closest I can get to Nana’s tamales, considering the available ingredients. I’ve taught many cellies how to make them, the same way I learned as a young boy — by helping with the preparation. These tamales take a day and a half to prepare, but I believe the time and love that go into making them is what keeps me connected to my family and my culture. It also reduces the loneliness in my heart and my guilt for the hurt and pain I’ve caused my family. I know that if l feel that pain they must feel it even stronger, because they’re not the reason I’m here — I am. On Christmas Eve, I roll up my mattress and place it on the top bunk so I can use my bed as a large table. I clean the bed and walls with disinfectant the prison passes out on the 1st and 15th of the month. I start boiling water in the hot pot and crush corn and nacho chips to a fine powder. This is a long process that can take a few hours to complete. 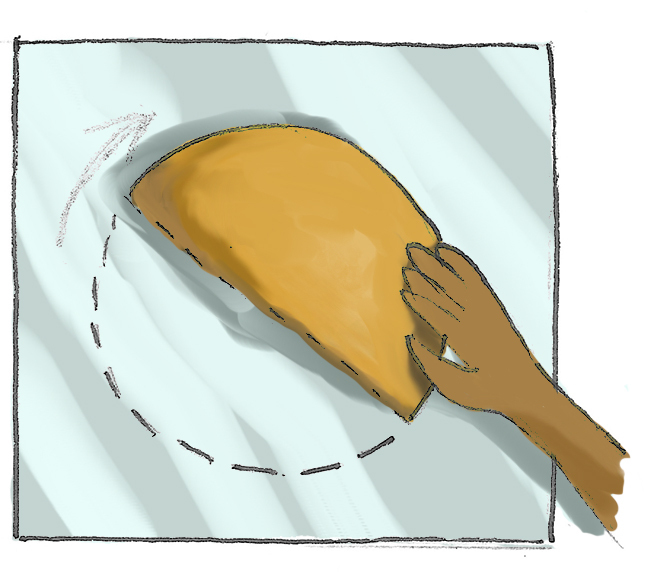 Once the chips are crushed to powder, I place them in a large plastic trash bag and pour in boiling water until the masa takes on a soft, clay-like consistency. Inside the container of boiling water are also pouches of meat and summer sausage. After they’re cooked, I dice them and mix them together. Packaged beans are mixed with hot water and then they, too, are mixed with the meat. The jalapeños are chopped and placed in a bowl. I cut small trash bags into 10-inch squares and place them on the bed, ten at a time. After a ball of masa is flattened onto each square, the meat, beans and jalapeño mixture is rolled into the tamales. Then I place all the tamales in a plastic bag on the cement floor, which is very cold and acts as an overnight refrigerator. I’ve noticed over the years that allowing them to sit on the cold floor overnight hardens the masa and enhances the flavors. It takes a full day just to prepare the tamales and clean up, but the cell smells almost like home and there have been many times a correctional officer has opened the door because of the smell, wanting to see what I’m cooking. They’re often amazed at the ingenuity when I answer their questions about the recipe. On Christmas Day, I wake up around 5 a.m. and start the cooking process. I fill a 35-quart plastic container and submerge the immersion heater into the water. Back in the days when guys used stingers, if they didn’t immerse the blades in the water before plugging them in, they could blow out the power on the whole tier and they’d have a bunch of angry neighbors who were cooking their own holiday meals. I put the tamales in small plastic trash bags and place them in the water for about 3-4 hours until the masa changes to a dark beige and the plastic wrap separates from the tamales. When they’re done, I place them flat on the metal bed to cool down for 15-20 minutes. Then they are ready to eat. Whenever I make tamales, I become part of my people’s history. They are a dish that’s been around for hundreds, possibly thousands of years, made in jungles, deserts, cities and towns. And now, they’re made in prison. As I continue this tradition, I hope others will stop and think before telling my people they were conquered and obliterated by Spain — just look at our foods, language and customs and you’ll see that we’re still here. Every year, Nana and Mom want to know how my tamales turn out. I think it helps them to know I’m not sitting in a cold cell, stressing during the holidays. Instead, I’m doing my best with what I have, not allowing the poor decisions of my past to deprive me of the love that was placed in my heart by my Nana. I am incarcerated at Soledad Prison in the California Department of Corrections and Rehabilitation. During my 19 years in prison, I have earned a high school diploma and am working on two Associate in Arts degrees in Social and Behavioral Science and Arts and Humanities. Since 2004, I’ve been advocating for youth, especially those who are underrepresented and who live in a system designed to keep California’s 33 prisons full. My work has consisted of letter writing, youth diversion tours inside Soledad prison, and developing workshops to dispel glorifications of prison and criminal lifestyles. In early 2008, I began working at an in-custody Substance Use Disorder Treatment Program as a Mentor. In 2015, I was accepted into the state’s Offender Mentor Certification Program and graduated in the top percentile; I’m now a Certified Drug and Alcohol Counselor through the California Association for Alcohol/Drug Educators (CAADE). My greatest achievement and most difficult challenge has been and is being a dad in prison. I am proud of my 21-year-old daughter Marlena and the path she’s taken in her life. Education and my family have been instrumental in my development. Soon I will be married to my fiancée Rebecca, who is attracted to the changed man I am today. Gilbert Bao is incarcerated at the Correctional Training Facility in Soledad, California, where he is a peer mentor and certified drug and alcohol counselor. He is working toward two associates degrees, in Social and Behavioral Science and Arts and Humanities.